Lowe's Iris is officially history! get that value out of it. Reimbursement is basically the suggested retail price of the items, tax not included. I Believe the smart plugs get $35.00. I heard nothing about a “limit” on a reimbursement amount. I’ve had Iris since the beginning of the system, and have a lot of V1 devices. The limit is only for adding additional items that were not connected during the initial snapshot of your system. Some have said they got upwards or $3000. I personally got $560 plus the $300 when I called back, so $860 is a nice little sum to boost my current ST system with. Too bad for me. I have ~150 iris devices, all only ever connected to SmartThings. If your devices are compatible with other systems, like SmartThings, Lowes is not refunding any money for those devices. My only device is a “less than a year old - actually 6 months old” water softener. I JUST paid $250 to have it installed. For some of these “major” appliances, has anyone inquired about installation compensation? I purchased the LG ThinQ Smart laundry appliances at the time when Lowe’s announced their “partnership” in January 2016. I was assured by upper management that the integration was going to be released in 2-3 months. They were promising that you could schedule start times for laundry cycles, controlling devices when the cycle ends, etc. None of it ever materialized. I’m stuck with overpriced LG “Smart” appliances that can only trigger an IFTTT event when a cycle is done. That is a task that can easily by accomplished by a $20 multipurpose sensor. Lowe's will shut down the Iris smart home platform on March 31, but allow customers to be reimbursed for certain devices. I received a $800 rebate for an Iris Water Softener - believe it when I see it, but according to the email. I like their sensors much more than the Smartthings sensors. Any idea if these sensors will be available at other vendor’s sites or are they just going to disappear? Lowe’s customer service told me they’d be sent back to the manufacturer. But I’ve also seen people here say that they’re on clearance. In my local Lowes they have no Iris devices for sale on the shelf or in clearance. They have SmartThings devices on clearance. For example the new ST contact sensor at my Lowes is $16. 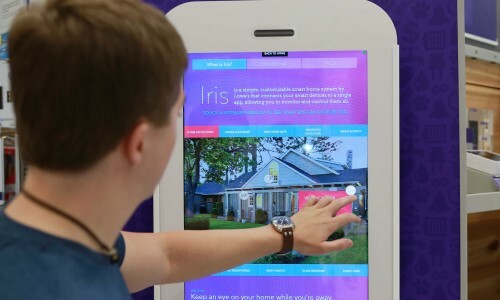 It is doubtful Lowes will discount or unstock “all” smart devices. But I assume any device which ONLY works with IRIS is no longer available. Other IRIS devices which could connect to like a Smartthings Hub - might still be for sale, and because it’s branded IRIS, may be at a discount. Has anyone successfully paired the Radio Thermostat Company of America CT-101 thermostat (Iris Version) with Smart Things? The Smart Things compatibility page lists that thermostat as “Coming Soon”, but I need connectivity by the March 31 expiration of Iris. Thanks. Just search for CT-101 in the forum there are many threads. It does work. I paired 2 of them. I deleted them in Iris, hit the reset button on the CT101 (under top cover), and ST saw them in the autodiscover in the new app - very easy. Were they just contact sensors, or the multi purpose sensors? Seemed like the multipurpose ones. That said I’m not sure. I haven’t bought any or looked at the new ST sensors. Anyone actually received their Visa card yet? Just curious on timing. My redemption process was completed about two weeks ago. I think the paperwork said they have a year. call them for an additional manual rebate. I had to for a few that I had not paired to the system yet.